Don't miss out on the current unicorn craze! 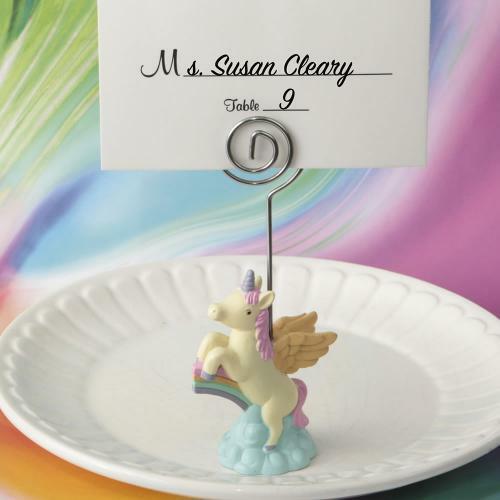 This adorable unicorn place card holder will display seating arrangements and can be taken home to show off a sentimental photo of your special day. This adorable unicorn is made from polyresin and is hand painted in an ivory color. She has a pink mane and purple hoofs. She flies on a beautiful multi-colored rainbow that sits on top of puffy blue clouds. Attached to the unicorn is a silver metal wire with a coiled top for easy insertion of a place card or photo. A blank place card is included. Bring a touch of unicorn magic to your next event and offer guests a lovely memento to take home. Size 4 1/4" x 1 5/8" x 1"